Only thing was, the original recipe called for orange juice. A lot of folk like orange and pork – truth is, I like the sound of it – but the flavor? No, thank you. Hmmm, I did, however have a freshly opened bottle of apple cider. Yeh, that should do it! 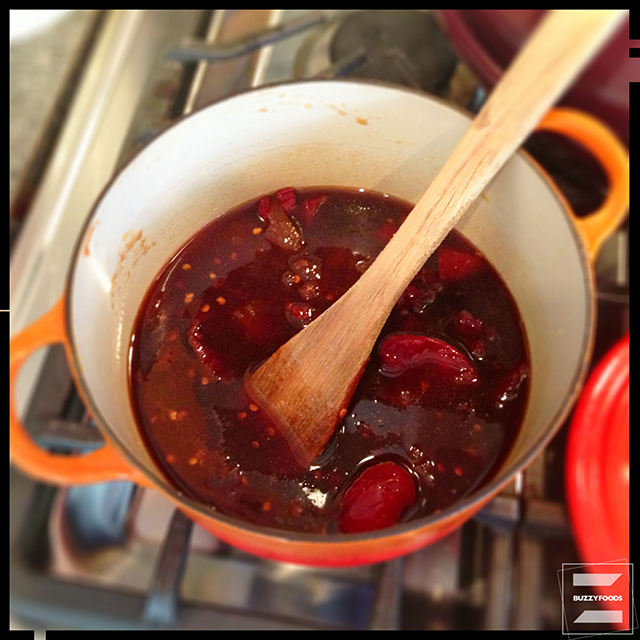 The original recipe also called for instant coffee – well, instant espresso should be fine – and plum sauce. Hmmm, I did have a jar of my own plum sauce in the back of the fridge. but there wasn’t quite enough to do the job. No problem – I had several jars left of last year’s plum jam which would no doubt do the job. 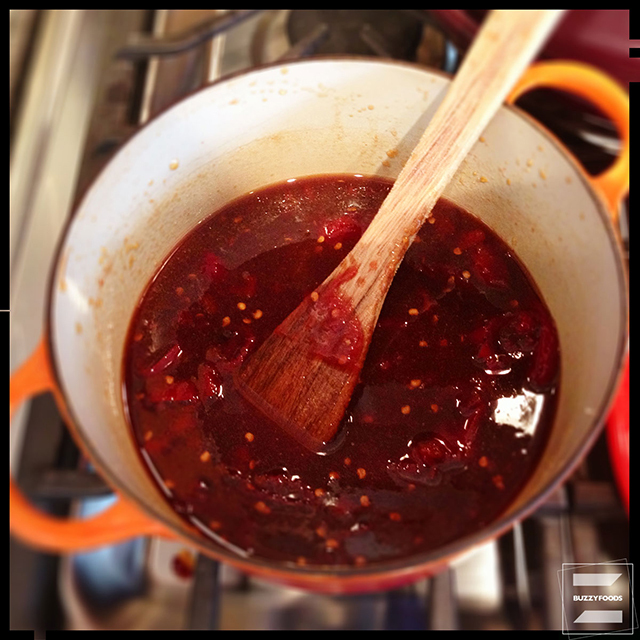 All in all, quite a nice sauce for ribs – and mebbe chicken, too! I should note that when I first sampled the basic sauce, I thought it nice, but a bit, ermmm, tingly for most folk’s enjoyment – I mean, I like it when mu lips feel all warm and, yes, tingly after eating something, but others do not share this enjoyment, so I toned the sauce down a wee, tiny bit. It’s still got a bit of a sweet-heat kick to it, so don’t fret that it’ll be too mild. Oh, and if you want to try the original, by Marcella Valladolid, here’s the link. Dissolve the espresso in the hot water, then add to a medium pot with the remaining sauce ingredients. Bring to a boil over medium heat, then reduce the flame and simmer for five minutes until the sauce has thickened slightly. Set aside to cool. Heat the oven to 350º and line a rimmed baking pan with foil. 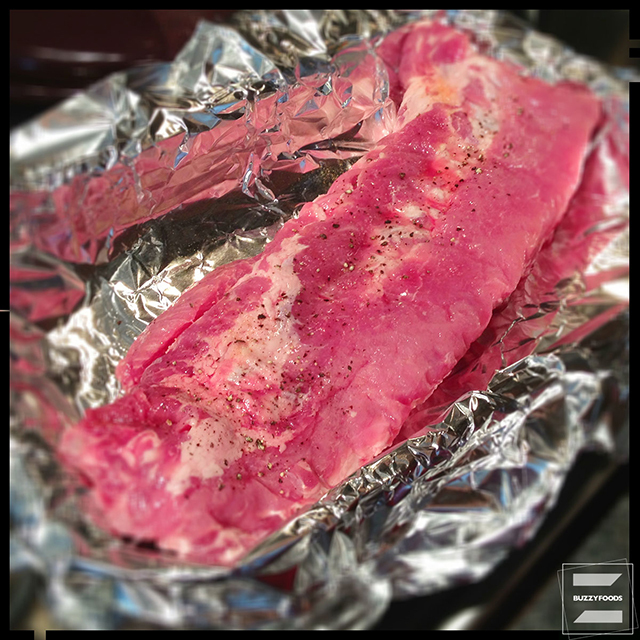 Arrange the ribs in the pan and season both sides with salt and pepper. 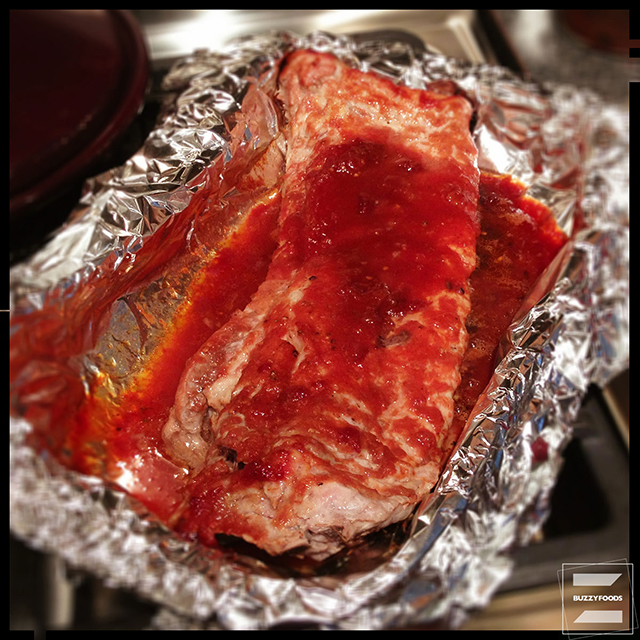 Drizzle both sides of the ribs with some of the cooled sauce – reserve at least a cup for later – then cover the pan tightly with more foil and pop into the oven for one hour. After the hour is up, remove the cover from the pan, pour off some of the accumulated liquid, then brush the ribs with about half of the remaining sauce. 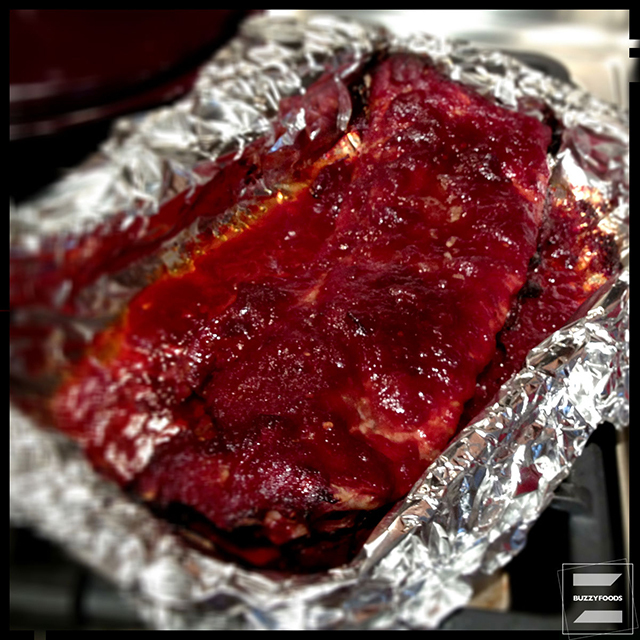 Pop back into the oven, uncovered, for another hour, basting the ribs with the rest of the sauce after thirty minutes. Remove from the oven and allow to rest for 15 minutes before serving – it was really hard to wait that 15 minutes, they smelled so goood! 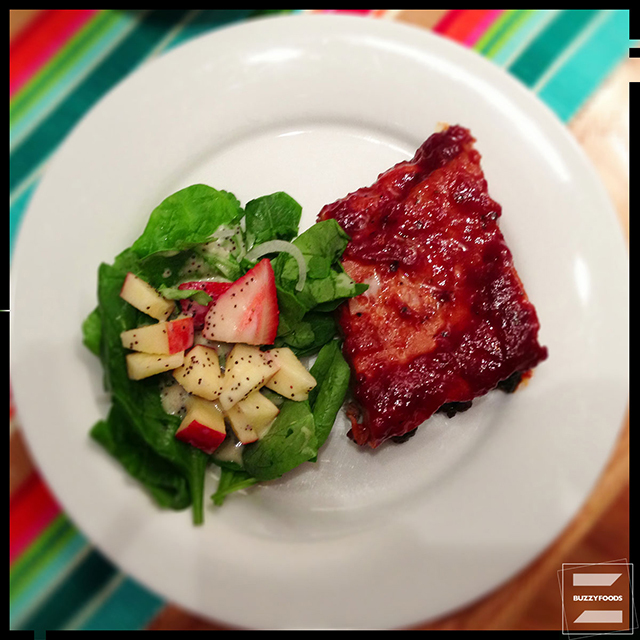 Perfectly cooked, nicely spiced, moist, tender – pretty darned tasty ribs. I strongly suggest you try either version, soon! 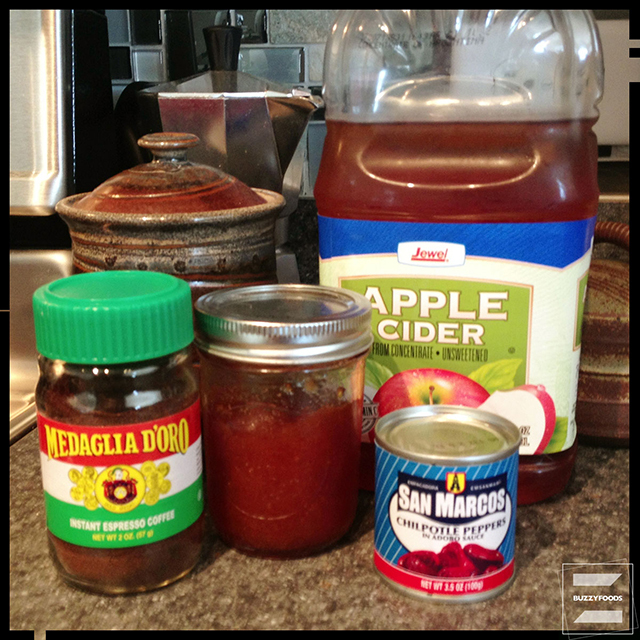 This entry was posted in Pork and tagged 'sup!, Apple Cider, Barbecued Ribs, Brown Sugar, Chipotle Barbecue, Chiptole Peppers, Espresso, ketchup, Plum Jam, Plum Sauce, Pork ribs, Ribs. Bookmark the permalink.